Toronto Dingos take on the Central Blues tomorrow for their round eight clash at Humber South. It’s a big game for both clubs. 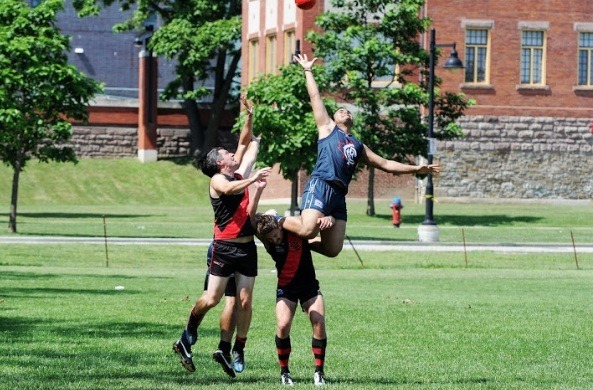 The Blues are 3-4 and had a big win over the Roos last week; the undermanned Dingos are 2-5 and also won big over the Hawks at Scarborough U of T. Both clubs are vying for the final spot in the top six. The Central Blues match will be a tough, close affair. The Blues have a solid blend of Aussies and Canadians and are not short of run-and-carry players as well as key forwards. Here’s a look at the record against the Central Blues in the past five outings. The Blues haven’t won against the Dingos since R10, 2011 and on that day they won a nail biter by 8-pts. This Rnd 8 match will also be televised on Rogers TV and be shown on Sunday July 20 at 7 p.m.